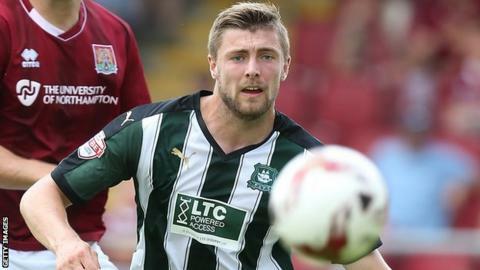 Plymouth Argyle striker Ryan Brunt says getting his first goal of the season will help his quest for a regular first-team place. Brunt scored in Argyle's 3-2 win over AFC Wimbledon in the Johnstone's Paint Trophy on Tuesday night. "I'm still on the first steps on the ladder to do that, but I'm going in the right direction," he told BBC Devon. "I've got to earn my place and getting the goals and putting the performances in is how I'm going to do it." Brunt joined Argyle from Bristol Rovers in January and has scored four times for the Pilgrims, including one in the club's League Two play-off semi-final second-leg loss at Wycombe. Having found himself on the bench at the start of the season, Brunt has started the club's last two matches following an injury to leading scorer Reuben Reid. "It was nice," said Brunt on getting his first goal. "It was needed for me personally to get off the mark. "I had to wait for my chance and now it will give me some confidence to take my chance and progress as I hoped I would in pre-season."